, an entity which regularly picks up the highest federal allocation in the country has made me to begin to appreciate the saying and to imagine that in truth money makes some mad, just as others madly pursue it. However, each time I visit Rivers State, I always wonder why the pace of development I see is never commensurate with the huge sums the state gets. With the unending political turmoil in the state, it is getting obvious that its political class is the forerunner of the state’s madness as that class behaves more often than not like a child born drunk. During the Amaechi era, the state was virtually at war with the federal government, a fight that was instigated by highly placed persons who are either by birth or by association from the state. The fight against Amaechi was both within and outside the state. At the national level the fight was so intense that it created a new mathematical theory in which 16 became greater than 19. It did not only rubbish Amaechi as the then entire Nigerian governors’ forum was bruised. Amaechi in particular had to fight all through with several federal agencies such as Aviation which often grounded any aircraft which associates with the governor. At the same time, the security operatives had an agenda to execute just as the commissioner of police in the state made nonsense of the governor’s legal position as the chief security officer of the state. Under the watchful eyes of the police, state legislators assumed the status of political thugs and fought to the level of producing broken limps and skulls. Indeed, the fight which was transmitted LIVE on national television featured an attempt by 5 legislators to gain power by suspending the remaining 27 of their colleagues. While this lasted, governance was at abeyance. Also on national television, viewers watched the conduct of the 2015 general elections and listened to election observers make statements about the election which we cannot describe at this point in deference to an election tribunal which is right now looking into the same matter. But we are probably the only ones to whom ‘subjudice’ has a meaning; the war lords of Rivers State who incidentally are lawyers like us have no time for such decency or the rule of law. To them, politics is essentially a game in which the end justifies the means; in which case, it has to be won by whatever weapons. 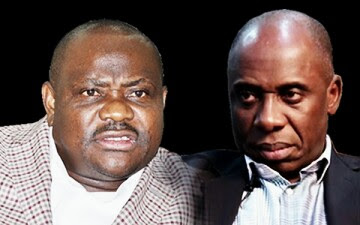 Even before the election tribunal was sworn-in, the then ruling party of Rotimi Amaechi that was declared the loser had gone ahead to conduct local government elections with its own “independent” umpires, who during elections in the country are normally quartered in government houses. Although the local elections were held in the last one week of Amaechi’s tenure and in disobedience of court orders stopping them from holding, the government party “swept” the polls thereby creating more room for violence without governance. As soon as Wike became governor, the courts nullified the local elections giving him opportunity to reconstitute the councils with his own followers. He also went on to reverse anything Amaechi did including re-instating into office a person whose purported election to the office of governor had been declared to be unknown to law by the highest court of the land. He then set up his own judicial commission of enquiry to probe Amaechi’s government. Whereas the probe panel is headed by a judge who some say can be fair-minded, there is ample evidence that his panel is organized to find Amaechi guilty. This is because the same issues the court is investigating are being simultaneously tried in several other fora. On one occasion, the evidence of one witness as reported by the media was like a drama piece. Rather than just confirm that Amaechi’s government awarded a ‘fraudulent’ contract, the witness ridiculously added that the former governor had to sack his cabinet so as to be able to award the contact to his proxy! Can that happen in Nigeria where Commissioners genuflect before every member of a governor’s family? Even if such a miracle happened in Rivers, why did the Commissioners wait to be sacked instead of resigning en masse in protest?